Over the holidays we went to Disneyland for the day. 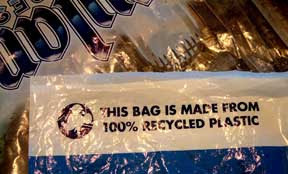 We were happily surprised that throughout the park all of the plastic bags used at the various stores are now made from 100% recycled materials and are in turn recycleable. Of course the best choice is to not use a bag, but Disney is making an effort in the right direction. Positive actions need to be applauded. Everyday you have choices. You can choose to be environmentally responsible - helping the planet and therefore yourself. This started as an attempt to come up with 31 Green Holiday Actions and became the beginning of a community of friends and strangers sharing ideas about sustainability. We all know in our hearts that we are pushing the planet to the edge. We all know that we have to change the way be act on a daily basis, but change can be threatening. Still, if we work together and make little changes that are lasting, maybe we can leave our children a better world rather than one teetering toward calamity. When I was 7 years old I wrote to then President Nixon about the gray whale that was rapidly disappearing from along the California coast. Enough adults and children kept after our public officials until the Marine Mammals Protection Act was passed in 1972. Given a chance, life on our planet is resilient. Today the gray whale population has stabilized, blue whales and humpbacks swim in increasing numbers along California's coast. Right whales are breeding along the east coast of the U.S. Are whales and other sea life in trouble because of ship traffic, climate change and pollution in the ocean? Yes. But in the 1960s, we were afraid that whales would cease to exist because of whaling and fishing practices. We can make positive change, if we work together. Let's make 2010 the year we save the planet. A few things make me cringe when I open a package: foam packing peanuts and metallic plastic sheeting. This year no foam peanuts exploded from a well-packed gift box. That was a blessing. No storing them, no trying to figure out how to use them without setting them free in the environment. But this glittery problem was given to us by well-meaning friends. This is the metallic plastic sheeting or polyester film that I warned against in "Just Say 'No' to The Shiny." And in this case, it is already shredded into small bits. If I "throw it away," it won't be gone. It will fly up into the air or cling to the side of the trash bin. It will find a way to escape from the trash truck. Next it will tumble down the street, wash down a gutter, make its way to the ocean and into the gullet of a bird or fish. It is bad news. If I keep the shiny menace, how can I reuse it? If I pass it on to someone else, they will have the same problem I'm having. It's like passing on a virus. If you have a good idea on what action can be taken to deal with this flashy shredded polyester film, let me know. The only thing I've come up with is using it in a few experiments to show how hazardous it really is. Don't make this mistake. Don't curse your friends and family with a needless environmental burden. I am not a vegetarian. I'm an omnivore and I admit that I like the taste of meat. But it is a fact that when you eat higher up in the foodweb, you are consuming more resources. For example: If you eat a salad, the lettuce, tomato, carrots, cucumber, etc., the plants are all "producers" who take in energy from the sun and convert it to energy stored in their leaves, roots and fruit. When you eat meat, the animal had to eat plants or other animals to get the energy it needed. Animals are "consumers" of "producers." The further away you get from a producer who converted the sun's energy to its own use, the more resources are needed to create the same about of energy. So when you eat a piece of meat, you are also eating all of the food that that animal ate. Vast tracts of land around the world has been lost from native forests and grasslands to provide grazing areas for domestic animals that provide meat. A great deal of plant food and fresh water goes to raising animals for food. Waste from domestic animals also creates pollution problems. Reducing the amount of meat we consume could help the planet significantly. With that in mind the Union of Reform Judaism is proposing the Green Table/Just Table initiative. They are supporting eating locally produced plants and animals, eating food grown and harvested by people that are treated justly, and reducing meat consumption. The food we eat is part of the Earth's splendor and it should be treated with respect. Because we don't have to catch it, raise it, or butcher it ourselves, meat has become very easy to consume in the last 100 years. I'm going to aim for eating low on the foodweb twice a week. Won't you join me in Veggie Tuesdays and Thursdays? As we approach the beginning of a new year, I'm making a resolution to bring a Green Practice into our daily living each month. 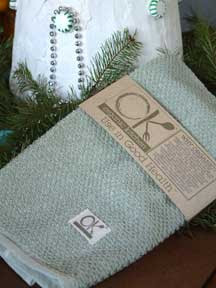 organic cotton dish towels - Pay attention to the fibers you surround yourself with. Cotton is a natural plant fiber. People and other animals have been using the soft, insulating fibers of cotton for thousands of years. But growing cotton can be hard on the land, especially if pesticides and herbicides are used. Organic cotton is more expensive in the store, but less expensive in the long run because it does not contribute to other environmental problems. 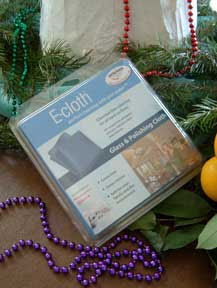 e-cloth - This is a new product for me, it is a special cloth that allows you to clean glass and polish surfaces using only water. I'm excited to give it a try. I'll keep you posted on how it works. The choices you make on everyday items, especially cleaning products can make a big difference in the environment. Not only are you making choices that are healthier and more sustainable, but you are also letting the producers of products know that you will stand up for the environment with your pocketbook. The best way to take a polluting product off the market is to not buy it. Today I got in the mood to take some of it down. But I'm still using some of these branches because now they are providing mulch on areas of the hillside that have bare earth. Smaller branches went into our household green bin provided by the city. This green matter will be chipped and composted by the city. Our live tree went back out into the yard. But if you have a cut holiday tree, you can still make green choices. If at all possible, don't send your tree to a landfill. In Los Angeles, you can cut up your tree and put it in your green bin for vegetation. You can also recycle the whole tree by taking it to a number of drop-off locations at parks and fire stations throughout the city. For a location near you, check out the L.A. City Bureau of Sanitation website. The designated locations in L.A. will only be recycling whole trees next weekend, Jan. 2-3, 2010. 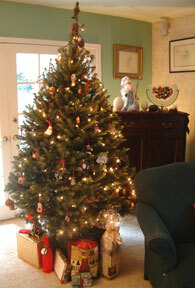 Follow the directions on the city website for how to prepare the tree for recycling. 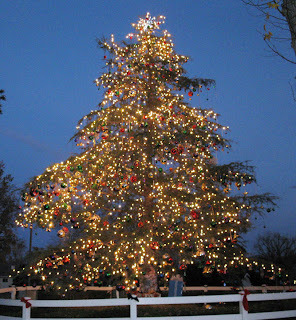 If you live outside of the Los Angeles area do a web search with key words "recycling Christmas trees" and your city name. Many cities offer some way for you to recycle holiday trees. I been doing this for years myself. Sometimes a beautiful tag made from a holiday card can become the focus of a gift's wrapping. 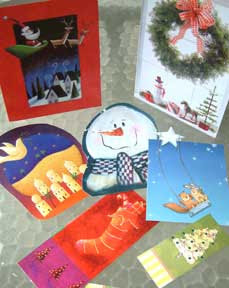 You can fold them, cut them into shapes, or just use parts of a card's decoration that you like the best. Have you noticed that there is an added benefit to getting multiple use out of resources? It saves financial resources as well. This year at our family holiday gathering we tried to act green while opening presents. We placed two large containers in the room for wrapping paper that was recycleable, a basket to collect reuseable bows and ribbon, and a container for trash. A couple of the gifts were inspiring and creative, more on that later. Hope you had a day filled with joy and giving. 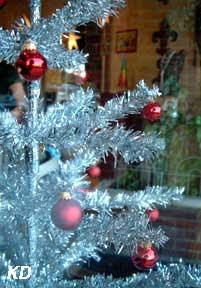 Here's a photo and suggestion from my friend Eleanor - decorate a living tree outside. A living tree is never perfect, but it is always part of the earth. When you decorate a tree that is already living and growing in your yard or garden, you are demonstrating your connection with the world around you. Throughout the year this tree in Santa Clarita is habitat for birds and insects. Though it dresses up for the holidays, it continues to be part of the environment. Whether you bring a living tree into your home, use a recycled tree, or decorate a tree in your yard, you are making a choice for a more sustainable future. Santa has a very green practice, he plans his route for greatest efficiency. Whether it is last minute shopping or delivering gifts from your hearth, plan your route. Making one well-mapped-out sweep to all of your intended destinations, rather than multiple trips, will save resources and time. Recycling can come in a variety of forms. What we used to call antiques are actually recycled items–furniture, glassware, china, and even decorations–that are passed on from one generation to the next rather than being disposable. Think of your holiday decorations as a resource investment. Skip the cheap disposable items and make your purchases something you can use for years to come. One of the important actions you can take for the planet and yourself is to know the ingredients that go into the food you eat. Palm oil is a common ingredient in packaged foods and even cosmetics and soaps. While some palm oil is grown in sustainable ways, most is grown on large plantations that are chopped out of important tropical forests. Vast areas of Indonesian forest, vital to plant and animal biodiversity, are lost to supply palm oil for products sold in the U.S. The choices you make when you buy soap products or a box of cookies can have a direct effect on creatures a world away, like wild orangutans. I was surprised when palm oil was an ingredient in my dog's favorite natural dog cookie. For more on orangutan issues: Orangutan Conservancy. My friend Brian makes an incredible mustard. I made sure that I was on his Santa list again this year. 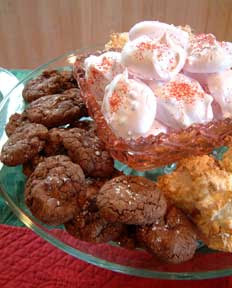 Homemade baked goods typically have lower fat levels and calories because they don't include palm oil and fats with a long shelf life. My lemon tree has a bumper crop this year. With lemons in the market at 50 cents a piece, a bag of lemons in a repurposed net bag has been a welcome gift for many of my friends and neighbors. I tried a new recipe and made a cranberry liquor. People are asking to be on that Santa list for next year. But don't tell my sister, because I made it as a gift for her. When you give from your hearth, you give from your heart and you make the choice for that heart to be green. How about a party that is low in impact and high on Holiday Spirit. Friends of ours, Douglas and Rosanne, started this party tradition four years ago. A group of us gets together to read Charles Dickens' classic A Christmas Carol aloud for a live audio production on the Internet. Not only is this a different kind of interactive event, the kids that have participated are growing up to be exceptional readers and confident public speakers. They started out doing sound effects - chains and creaking doors. Now they read and for our Halloween Ghost Stories reading this year, they came with their own material. You can listen to A Christmas Carol LIVE or even participate via the Internet. We will be live at 3 PM Pacific Standard Time. You can also watch the video captured live on uStream.tv. Watch the 4th Annual Reading of Charles Dickens' "A Christmas Carol"
To listen to previous audio productions check out Eclipse-1 Media. 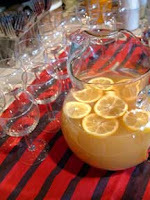 Party planning always brings into question whether to use paper, plastic or dishware that needs washing. Plastic is out. 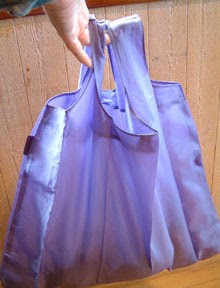 Some plastic can be washed and reused. But in the end, it is still plastic. There are some new products made from biodegradable plant starches that do offer a disposable option. Unfortunately, they aren't always easy to find. For napkins, I went with cocktail napkins made from 100% recycled paper - 50% post consumer - with water based inks. 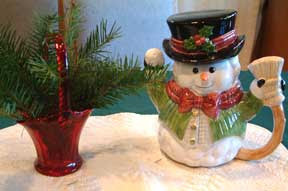 And better yet, they were made in the U.S. Do they have pictures of snowmen or poinsettias? No. But they are neutral with a leaf pattern. In the end I decided to use my stainless steel silverware and some restaurant grade glass plates leftover from my days as a caterer. These glass plates are durable, go with everything and wash easily. Yes, I will be using water to wash my dishware, but I think it was my greenest choice. Maybe next year my holiday party will have an island theme and we'll have everyone eat off of banana leaves. The holiday tree is live. Decorations all came from yard cuttings and trimmed pine boughs. P.S. All those people generated only one small bag of trash and a large container of recyclables. The best part, we collected donations for a charity. Our Holiday Party a few years ago was lit only by candlelight. It was beautiful and very relaxing. Use common sense when lighting with candles. Make sure nothing flammable is near open flames. Provide at least 4 feet of open air above burning candles, otherwise you may have the opportunity to visualize carbon as it appears as soot on walls or ceilings. 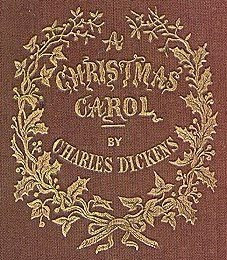 December 20, 2009 from 3pm to 5pm – Online Join us live for our 4th annual LIVE reading of Charles Dickens A Christmas Carol. Give up the bottle, the packaged plastic water bottle. This is a simple and dramatic action you can take to reduce plastic pollution and greenhouse gas emissions. We are very fortunate in the United States. Most of our drinking water is just as clean as the water that can be purchased in plastic bottles. Add in filtration through a modern refrigerator and you have clean water coveted by most of the world. You really don’t appreciate the luxury of available clean water until you travel to places where bottled water is a necessity - Turkey. But all of those empty individual-serving plastic bottles are a waste problem, not to mention the resources needed to produce them. Recycling helps, but each manufactured bottle is traveling by air or by truck for miles from its bottling origin to get to its point of sales. Refillable water bottles are everywhere this holiday season. But all bottles are not created equal. Bottles that will maintain the healthy quality of your water are made of stainless steel or copolyester, a new polycarbonate that is free of bisphenol A (BPA for short). 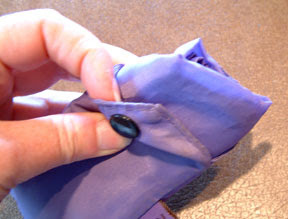 A third option is aluminum WITH a copolyester lining. Look for a quality product because your health matters. Name brands like Nalgene (U.S.), Camelback (imported) Klean Kanteen (imported) and others provide information about the materials in their container. You want a bottle that will last through many work days and adventures. The green and orange bottles pictured here have been all the way to outer Mongolia and back. 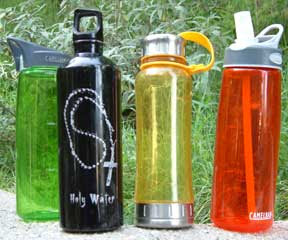 So drop a hint to your friends and family that a refillable water bottle would be a great gift item for you. You’ll make a difference and maybe they will wonder why you want such a thing. Then you’ll have a second action–passing on the message that it is time to give up the prepackaged plastic water bottle. What does recycling your cell phone or MP3 player have to do with gorillas, African forests and the welfare of millions of people? Inside your cell phone, personal computer and a variety of small electronic items there are capacitors coated in special minerals with a high tolerance for heat. These minerals reduce the transferal of heat within your appliance. What does this have to do with gorillas? Every resource comes from somewhere. Columbite and tantalite are two of these rare minerals. In processed form, they may be listed as tantalum on a label. The ore they are refined from goes by the shortened name coltan. Coltan is found primarily in Australia and central Africa. Legal mining in Australia has all but shut down because of the illegal mining in the Congo which is providing artificially inexpensive coltan. Very much like the blood diamond situation, coltan mining attracts militaries and war lords who use the profits from these precious minerals to fund their activities. Coltan is mined in open pits, destroying normal vegetation. Some of the major mining locations are within previously protected areas like Kahuzi-Biega National Park. 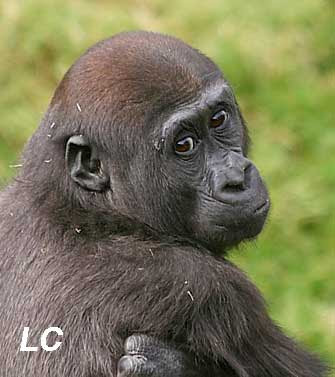 This U.N. World Heritage Site is home to one of the last groups of eastern lowland gorillas. With illegal mining activity comes additional cutting down of the forest for building and firewood. 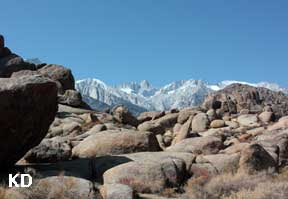 Armed parties have driven off park employees and threaten wildlife. The thousands of people digging the minerals require food; protected animals, including gorillas, are hunted for human food. Many of the people working in the mines are children or captives. We can all play a role in stopping this habitat destruction and human tragedy. These minerals, as well as gold and silver, can all be collected from electronic devices and reused through recycling. 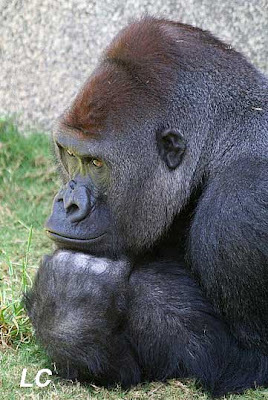 2009 has been the Year of the Gorilla. If you are giving an electronic gift this season, or if you receive one, don't throw away that old device. Help yourself, the gorilla and the planet by recycling old cell phones and electronics. We have a lot of cats in our family. My sister, my mother, and my mother-in-law all have cats. Rather than buying yet another cat toy, I made donations to a stray cat organization. What are you doing to make this a Green Holiday Season? 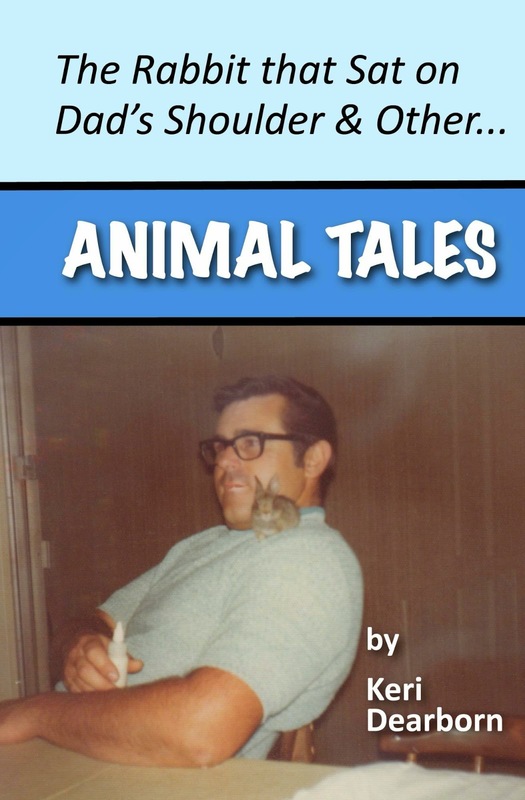 Leave a comment or send me an e-mail at 4animalbytes@gmail.com. How can you have a Greener Holiday Season? The Greenest gift is one that is directly from your heart to someone else. When you write a poem or a story, compose music or a song, or create artwork for someone, you are giving a gift of the mind and soul. 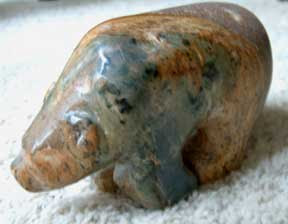 My mother carved this stone bear for us as a gift. Frequently, I stop short of doing this because I am afraid of rejection. But whenever I have been courageous and given a gift of the mind, it has always been deeply appreciated. Here is a poem for all of you busily juggling everyday life this Holiday Season. 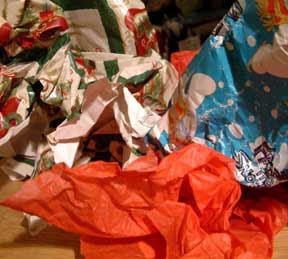 By recycled gift I do not mean rewrapping something you didn't want and giving it to someone else. I mean giving something you treasure as a gift to someone else. Some of my most prized possessions, the things that feed my soul, have multiple values. They are items of beauty or brilliance, but they also represent an aspect of someone important in my life. a small glass vase I received as a wedding gift. My cousin Alice had bought it for herself on her own honeymoon 40 years earlier. a book of poetry by Edgar A. Guest that my grandfather held second to the bible for influence on his life. The truly unique part is this grandfather was killed in an accident when my mother was only three years old. My Aunt Florence gave me this book and through it I know a grandfather I never met. It is always on my night stand. 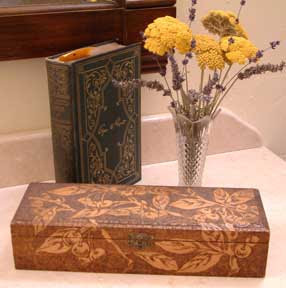 a wooden glove box that my grandmother Dearborn gave me that had been hand decorated with woodburning by her mother. It has been my treasure chest since my 14th birthday. Don't wait to will things to people that are important to you. Give beloved items while you can still tell the stories that go with them. Give good memories and the best part of yourself. Looking for a unique gift? For the next couple of days I'm going to focus on green gifts because that is what many of us are thinking about. How about a Green Action Gift? Many local conservation organizations are doing important work in your neighborhood as well as around the world. Ojai Raptor Center (www.ojairaptorcenter.org) Rescue and rehabilitation of birds of prey in the Los Angeles area. 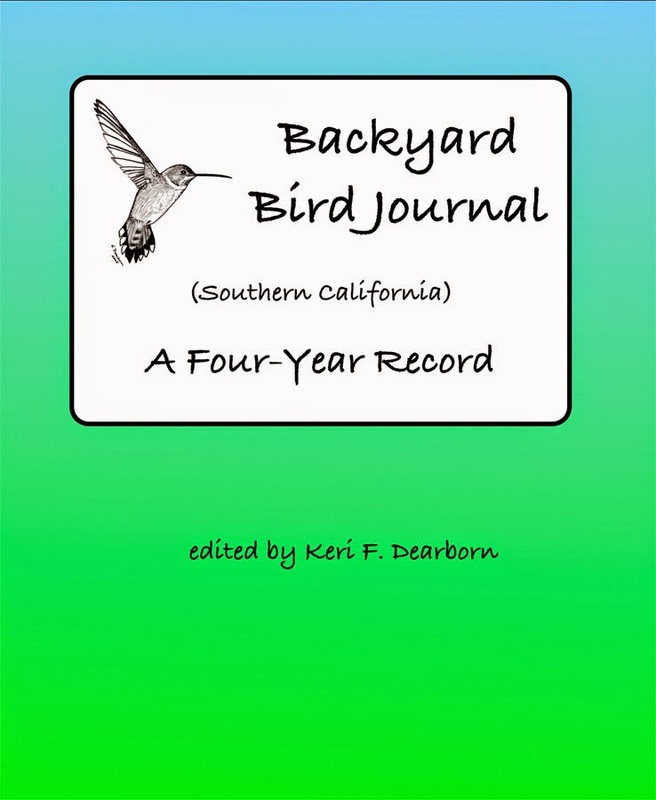 Adoption donations help to feed unreleasable birds that are used in education programs. 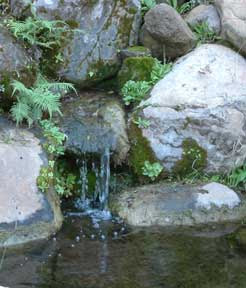 Nature of Wild Works (www.natureofwildworks.org) Cares for nonreleasable wildlife and provides community education in Los Angeles. You can support the welfare of specific animals. 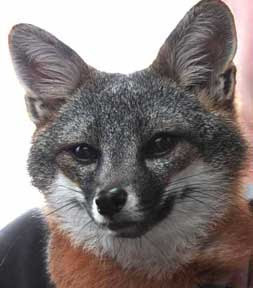 Catalina Island Conservancy (www.catalinaconservancy.org) Managing and preserving the wild areas of Santa Catalina Island, including the endangered island fox. You can support specific island projects. Habitat Works (www.habitatwork.org) Volunteers participate in local wildlife habitat restoration in the Los Angeles area. Ocean Conservation Society (www.oceanconservation.org) Studies dolphins in the Southern California Bight off Santa Monica. Adopt a local dolphin. These are just a few in the Los Angeles area. If you give close to home you have a better opportunity to know how your donated funds are spent. Look for organizations designated 501 (c) 3 non-profits, that way your donation will be tax deductible. And ask your friends for the names of groups or organizations where they have volunteered. Tomorrow Recycled Gifts and then Giving From the Heart. Go Live. Bring a living tree home for the holidays. A live tree in a pot speaks your green intentions louder than your voice ever could. A living tree brings the forest into your home without reducing wild lands. 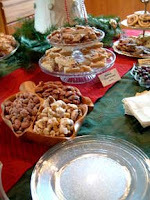 It becomes part of the family participating in the holidays year-after-year. No tree is killed. No waste is added to the landfill. No plastic is created. And that living tree is a carbon sink, securing carbon in its trunk and branches as it grows. This will be our 4th year with our living tree. It has now more than paid for itself. Yes, I do have to water it. With our drought conditions this summer, most of the water for the tree came from kitchen gray water. I also feed the tree twice a year. Our tree has grown about 10" since it's first year with us. See the Tree. I'm hoping to bring the tree in this weekend, but right now it is enjoying the rain. When we bring it into the house, we will slide the pot onto a large piece of heavy plastic sheeting. We gather the sheeting up around the sides of the pot and then tape in tight around the pot's top edge. 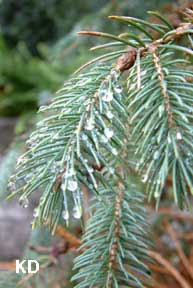 This way we can continue to water the tree while it is indoors and exposed to warmer, drier conditions caused by indoor heating. This also protects the carpeting. 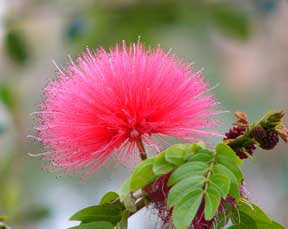 More and more nurseries are offering a variety of living trees. Take a look at them; they are an investment in your greener future. Look for one a little bit smaller than you might usually buy because you want to be able to use it for a number of years. 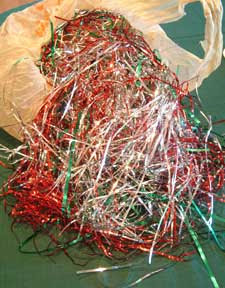 How many tons of gift wrapping materials will be discarded on December 25th? You can help reduce the amount of disposable paper, plastic and bows by investing in reusable wrapping. 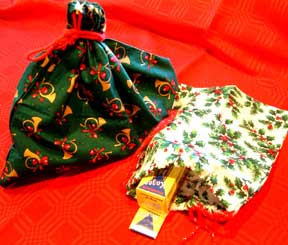 Fabric gift bags are a staple at many church and organization Holiday Bazaars. They are also easy to make. (They can even make a great gift.) 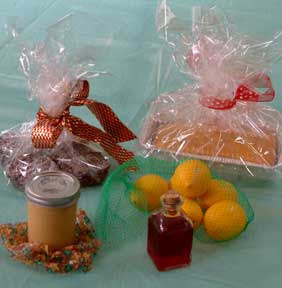 These simple fabric bags with drawstring or ribbon closures are pretty, practical and reusable. Over the years I have purchased a variety of sizes and fabric styles. They are the perfect way to wrap small items for stockings. But I also have larger sizes that hold a shirt box or even a 10-ream paper box. I've had a number of these Santa Bags for over 10 years. Not everything under the tree is wrapped in a bag, but each Santa Bag represents saved trees and reduced trash. When it comes to being attracted to the shiny and glittery, humans are no different than birds. But we aren't just attracted to them, we create them and some of the flashy holiday decorations and wrapping choices are bad news for the environment. Metallic plastic sheeting or polyester film, familiar to most of us by the trademarked name Mylar, was originally developed for use in space. Thin, durable, lightweight and cheap to mass produce, polyester film can be seen during the holidays as wrapping paper, balloons, bows, garlands, even confetti. Unfortunately, these bits of sparkle do not biodegrade. If you throw it away, it isn't gone. What may be an inexpensive purchase today, may be a costly clean-up for the future. Avoid the shiny this season and if you receive it, reuse it. These plastic films last a lifetime. The bow in the picture came into our family several years ago. 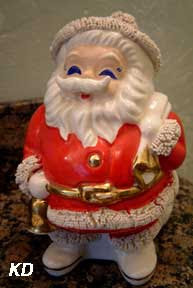 It will be used again this year, then go back in the box to reappear next year. When you decorate for the holidays, you have a choice to be Green. 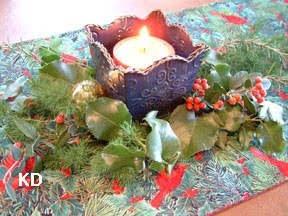 Lead by example, here's an idea from a previous post Green Holiday Decorations. This week the world is focusing on the climate meeting in Copenhagen. What can you do? Talk calmly with facts to friends, family and neighbors about global climate change. Polls released earlier this week, stated that HALF of Americans do not believe that climate change is a real threat. I don't know why this is, it could be because the economy has become the main focus of concern for most of us. It could be because powerful voices have an economic stake in America's continued over consumption of carbon-based fuels and earthly resources. Because we have allowed the ability to pay for speech to be equated with the right to speak, those who can pay more to express their point of view will be heard the most. Unfortunately, fear mongering makes people defensive. Give a gift to the Earth: Help people understand the scientific facts of climate change and point them toward actions they can take to be part of the solution. The term "global warming" can seem unbelievable to people when temperatures dip to freezing. This morning there was a half inch of ice on my bird bath in sunny California. "Global climate change" more accurately depicts what is happening. Ask people to think about climate change. How are things different where you live? flooding, storm strength, drought. The drought cycle in California is lengthening. Fact: Deforestation is releasing large amounts of carbon stored in trees and reducing plant growth that should be absorbing carbon dioxide. The way we have been living for the last 100 years is unsustainable. If you look around at your local environment, you already know that. Let's all take action to work together toward cleaning up our destructive habits and working toward a sustainable future. Here's a simple Green Action: take your own bag when you go shopping. In my neighborhood a number of grocery-type stores offer incentives for using your own reusable bags. Most of us have gotten pretty good at remembering to bring our own bags into the grocer. But the grocery store isn’t the only place to reduce the usage of plastic bags. 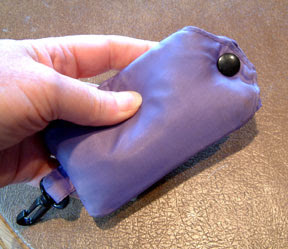 I have a wonderful little fabric bag that roles up into a small case. It is always in my purse ready to be used. Easily used canvas or fabric bags are also a great gift item. Plastic bags pollute waterways. They also mimic food in aquatic environments and are eaten by animals causing injury and even death. Every time you say “No” to a plastic bag, you save resources and make a positive difference. 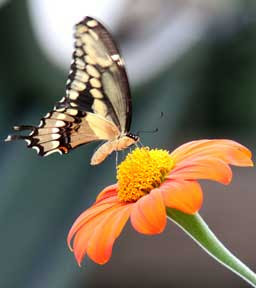 Before you run out to buy greenery grown a state or two away and trucked to your hometown or plastic decorations made in a foreign country, take a second look at your yard. All of these plants will stay green without water as they dry. Many will look great for two to three weeks. Other obvious choices are pine, cedar and holly, as well as eucalyptus, pyrocanthus or firethorn (red berries), succulents, and a variety of herbs. 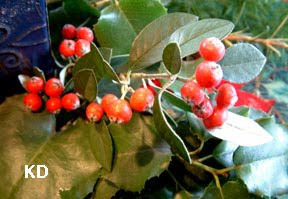 California natives like ceanothus and manzanita have beautiful deep green foliage and toyon or California holly has green leaves with holly-like red berries. The later is the plant that gave Hollywood its name. More on toyon. 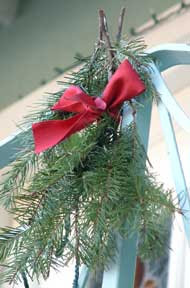 The idea of holiday wreaths and trees is to bring the living things of the forest into your home in the dead of winter. 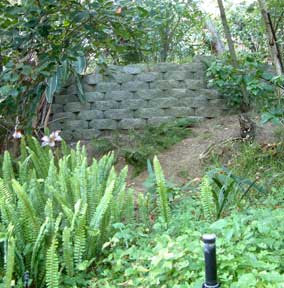 The best way to do that while preserving wild forests and lands is to sustainably harvest greenery from your own yard. Go foraging, you may be surprised at the botanical wonders you find. 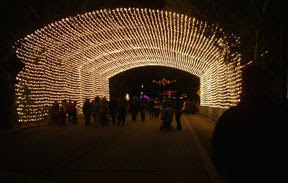 Throughout the Los Angeles area and around the country, the viewing of holiday lights is a seasonal treat. 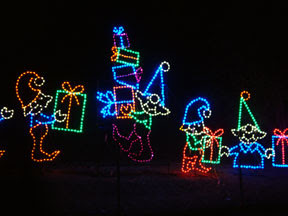 Typically, cars slowly cruise "Candy Cane Lane's" and other community spectacles. The Los Angeles Department of Water and Power (DWP) Holiday Light Festival is just such a mile long route decorated with festive displays. This year however the DWP is promoting greener viewing. Dec. 4, 2009 through the 17th, the route will be "vehicle free." We went last night to walk the route with other pedestrians. No car aghaust or long waiting lines, just bodies dressed warmly for a brisk California winter evening. Other evenings will provide access for bicyclers. 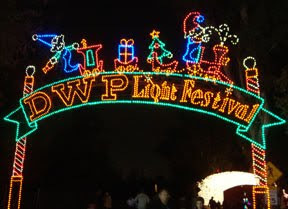 For more info about the DWP Holiday Light Festival visit their website. The lights depict a kind of history of the Los Angeles area. 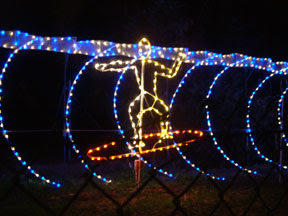 Where else would holiday lights include surfers? Make it a new holiday tradition to walk your neighborhood or other holiday displays. 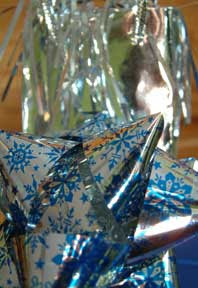 You'll have more opportunity to see the decorations, save gas and reduce the creation of greenhouse gases. And if you go and admire one large light display, you don't have to create a rival one at home. You can cut back a bit on your electricity use. 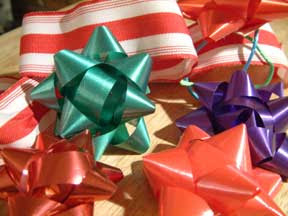 One of the easiest places to Green your Holiday Season is through the choices you make in gifts. Most of us do not need more things. 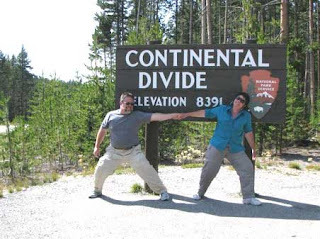 Give the gift of time together and shared experiences. Tickets to a cultural event–a play, museum, concert or movie, reservations for a special dining experience or high tea, or just set aside a date for an activity. All of these options can be Green Gifts. 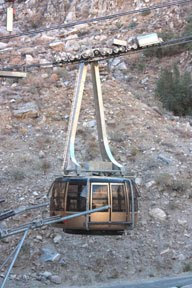 For my parents 50th Wedding Anniversary a few weeks ago, we all took a ride on the Palm Springs Aerial Tramway. It was an experience enjoyed by all–from my three-year-old niece to my seventy-year-old parents–and shared as a family. A toy or piece of clothing has a limited lifespan, a memory lasts a lifetime. As an additional bonus, these gifts financially support your local community. So stretch your gift giving imagination, and color it green. This year our family decided that instead of buying gifts for everyone in extended family, individuals that wanted to participate, would put their names into a hat and then draw a name for the ONE person they would give a gift. From grandma and grandpa to the teenagers, everyone wanted to participate. The price limit was set by those on the most fixed budget. Suddenly, I'm not running around spending time, resources and money to find gifts for a list of people. We've also reduced our use of wrapping paper and all the other resources that go with gift-giving. The best part might be that the sense of giving has a greater personal focus. I can concentrate on a great gift for one family member rather than just something for everyone to open. I have a couple of Green Gift ideas, but more on that later. I gave up holiday cards for letters years ago. What's the point of being in contact with someone only to offer an impersonal greeting written by someone else and only a signature to prove you are still living? Electronic holiday letters save trees and postage. I can create a full color letter with numerous photos and then export it in a pdf format. Simply attach that pdf file to an e-mail and my holiday letters are sent. Yes, there are still a few people that require printing the letter and applying postage, but I've dropped my mailing from 70 to 10. The fun part is that the pdf format allows for hyperlinks, so my family only has to click on a hyperlink to go right to my blog or other websites mentioned in the letter. They can see photos of the places and events I'm writing about and even video. 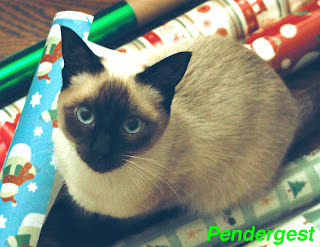 So use the Internet to make your Holiday Greetings a little bit Greener. Sustainability is the number one politically correct word on everyone's lips, but what does it mean? Sustainability by definition means living with the resources (food, water and shelter) that are available at your location in a manner that allows those resources to be replenishable so that their use is sustainable over time. When I look out my office window across the San Fernando Valley of Los Angeles, there is one thing that obviously comes to mind–this population requires more drinking water than is sustainable for this location. Disregard landscaping, bathing, pools, industry or any other water use, there just isn't enough drinking water here for all these people. It can make you want to throw-up your hands and say, "Forget it. Sustainability isn't possible." It inspired me to put forth this challenge to all of you. What can you do to make this a Green Holiday Season? Post your ideas in the comments or send me an e-mail at 4animalbytes@gmail.com. I'm challenging myself to post a green idea a day. As the representative from the Department of Health & Human Services said at the Council meeting, "Success comes from the bottom-up." 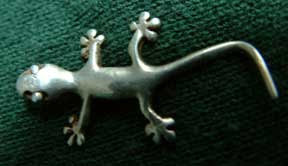 I saved time, greenhouse gases and money by using the Internet to find a specific product I was looking for as a gift. After locating the product, I was able to find the best price and purchase the item all on-line. Secondly, I realized this one item was the perfect gift for a number of people on my list. Gifts for 7 people will all be arriving in one small box through the mail. Your house is never perfectly clean. Cleaning up the kitchen periodically, vacuuming weekly, practicing daily actions that maintain your home environment are all beneficial. If you do nothing your home will soon become unlivable. The Earth is our only home, daily practices, even if small, can make a huge difference.